In a moment of curiosity, I thought I'd check in on Rotten Tomatoes and see how The Orville and Star Trek: Discovery are faring today. 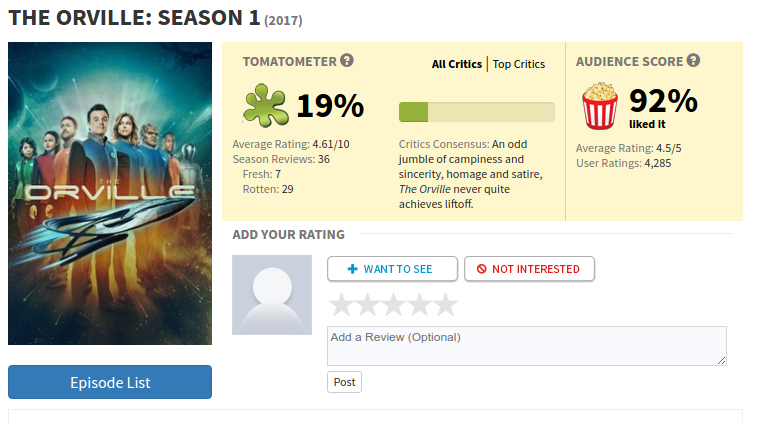 For The Orville, the critic score has dropped, but the audience score is higher than before. As I mentioned before, this discrepancy is massive, and cannot simply be explained by taste. Clearly, the broader audience here likes the show, and the critics are either clueless or biased. Notice the poster. This is an ensemble show, and it's reflected here. For Star Trek Discovery, the audience score has climbed a little bit. It's still a disappointing 59%, made more disappointing when you realize that the audience for this show is pre-disposed toward liking it, to the point of having paid a subscription to CBS All Access. Despite this, they're not nearly as impressed with the show as the paid critics. Also, notice the poster. This show has no ensemble dynamic, and it's reflected here. Unlike every Trek of the past, this is purely a vehicle for one character... a character which, judging by the vast majority of fan reviews, doesn't earn the spotlight. One who, as earlier noted, began as -- and remains -- a Mary Sue. ...and despite the fact that Star Trek Discovery has received 3,912 reviews as of this writing, you have to know to drill down to the season 1 page to see those reviews. You won't find them on the main page, where the superficially impressive "want to see" icon is used instead of the more disappointing 59% rating from those who have actually seen it. This artificially makes the show look more popular among viewers than it actually is. The Orville has a larger potential audience but a much worse timeslot. Nevertheless, with a similar number of reviews (4,285) the audience score of 92% is prominently featured on The Orville's main page. 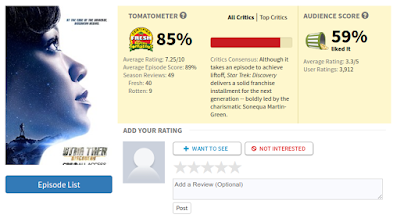 There doesn't seem to be anywhere on The Orville's main page to actually post a rating. I'm not saying there's something untoward, here... but I am pointing out something obviously inconsistent and strange about the way RottenTomatoes.com presents the two shows. As for me, if I had to pay for The Orville and got Star Trek Discovery for free, I'd still watch The Orville. The same can't be said the other way 'round. This is my last month of CBS All Access.